"Have been using unrealBook in live band set up for a year or so â€“ really useful app my man, thank you." "I just wanted to let you know that I used unrealBook extensively on my most recent rehearsal and showâ€¦.couple of weeks ago and it performed flawlessly"
â€¢Replace your bulky and heavy binders with a small and light iPad filled with your music PDF files. The alphabetized and indexed list makes it easy to find the song you are looking for. â€¢No more asking for a light for your music stand on dark stages. â€¢No more worrying about a breeze turning a page by accident. â€¢Search for a song quickly and easily. â€¢Create bookmarks that allow you to easily load up a large PDF and go directly to a page within. â€¢Use bookmarks and PDF files together to create set lists for different gigs. â€¢Hot spots allow you place highlighted areas on the page that allow you to jump from one page or document to another when pressed (think To Coda and D.S. signs). â€¢There is a built in music player so you can listen to your music while you check out the score! â€¢Connect to the world via email and dropbox support. â€¢Annotate your scores with auto-highlighted text and colored pens with different sizes. â€¢Create set lists easily. Jump to any song in a set list directly or step through the set list sequentially. â€¢Assign an iPad as a master and have multiple iPads slaved via bluetooth or WiFi! 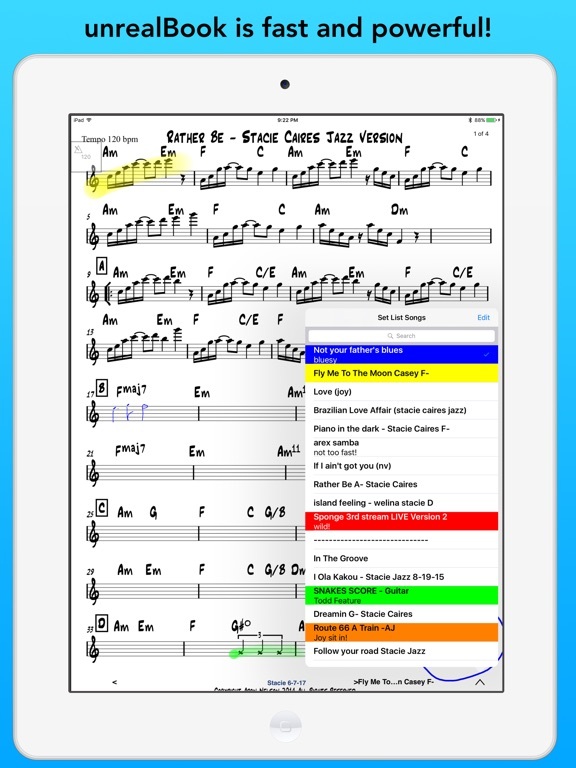 â€¢Record your rehearsals or your band on stage, all while reading music in unrealBook! â€¢Take pictures of a chart on a gig and create a PDF that you can use on stage. â€¢ Airturn Support for turning pages. â€¢ Use the iRig BlueBoard to jump directly to D.S. and CODA in a document via foot switches. â€¢ AirDrop an entire set list of files between two AirDrop compatible devices - including unrealBook Mobile on iPhone.